The National Leadership Esteem Ability and Discipline (L.E.A.D) Institute opened its 2012 life management male empowerment summit on September 24 under the theme “Stop the Madness.” The three-day workshop is being attended by students from the junior and senior high schools. Established in 2009, the institute is a community correctional organisation to provide programmes for “at risk” juveniles as well as pre and post prison/correctional facility inmates. District superintendent for high school curriculum in the Ministry of Education, Science and Technology, Ross Smith, read the speech of Minister of Education, Science and Technology Jerome Fitzgerald who commended Mr. Troy Clarke, Institute president, its staff and its Board of Trustees for the noteworthy efforts to positively impact the young men of the nation. He said the organisation is well on its way to providing additional community based alternatives to detention in the country. 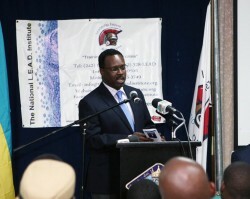 Mr. Smith read: “I take note of the fact that the National L.E.A.D Institute embraces the values of respect, ingenuity, integrity and good stewardship. Successful persons require these qualities to be ingrained in their character so that they can make a positive impact on those they come into contact with. I congratulate the institute for receiving “The Most Outstanding Organisation of the Year 2011-2012 Award,” from the Ministry of Youth Sports and Culture. This recognition is a testament to the excellent work conducted in this arena. Mr. Smith said the theme for this year’s summit, Stop the Madness, speaks to several needs. First, the need to reduce the number of young men entering the correctional system; secondly to decrease the level of recidivism and third to provide community based alternatives for youth who become involved in activities that may lead to law breaking. He said young men must be saved from this scourge that can lead to the loss of a bright future and even to a loss of life. Research has proven that disadvantages, disorganisation and dysfunction in the lives of teens and their environments (especially males) can lead to long-term or even life long consequences. Students from these types of backgrounds are seven times as likely to drop out of school increasing the rate of involvement in high risk behaviour such as crime, substance abuse, premature sexual activity and gang involvement. These activities often lead to severe family and social problems, incarceration, and even suicide. While noting these facts, Troy Clarke, president of L.E.A.D said this is why he became so passionate about assisting disadvantaged young men. “Youth delinquency is at an all time high in The Bahamas and there are currently approximately 2,000 inmates in Her Majesty’s Prison,” he said.